Ginseng is a slow-growing herb native to East Asia and North America. It is known for its stimulant effects on the body, but has many other purported uses for well-being and health. Although the studies on ginseng have proved inconclusive for the most part, health practitioners across the globe have used it to treat a variety of illnesses and health issues for thousands of years. In modern times, Ginseng has become a well-known supplement to many herbal remedies and is even commonly seen in energy drinks and popular iced tea beverages. As readily available as it is, and due to its lack of side effects in humans, it is definitely an herb worth learning more about. This article seeks to answer some of the questions one might have when considering using ginseng. Ginseng was originally found in east Asian countries, specifically mainland China, Japan, Korea, and Vietnam. There is a variety of ginseng known as Siberian ginseng which is not really the same plant at all, but a similar herb known as Eleuthero. Traditional ginseng also grows in North America, but specifically is native to the northeastern region of the United States from the Atlantic ocean across to Iowa and some parts of southern Canada. It is a shade-loving plant, so typically grows in forested regions and cool climates. Ginseng does not do well in southern regions where heat, bright sun, or dry weather will prevent its growth. The slow-growing nature of ginseng calls for at least three years of life before harvesting a plant. The plant will flower in the early summer and then turn to berries. Once these have fallen, then the plant is generally harvested in the early fall months. The entire plant can be used, but typically the root has the most medicinal properties. The root of the ginseng plant is large, and grows into several branches that are said to look like a human in shape. Latin words meaning “all-healing” and has similar derivatives to the Greek word panacea. It is through this history and mythology that Panax ginseng came to be thought of as such a powerful treatment. The Chinese even treated it with such value equivalent to gold or other precious items. There is a story that tells of a Jesuit priest working in Manchuria in the 18th century who learned of Ginseng and its capabilities from healers in China. He sent word to a fellow priest working in Canada to look for the plant growing locally. It was not long before the priest found it growing and began to cultivate it. This caused the plant to grow popular very quickly amongst European settlers, and the Ginseng trade was born. As a result of the highly touted use and export of ginseng in America and China, there are very limited resources still growing in the wild. Most ginseng that is produced and sold today comes from farms in Korea or from the northeastern part of the United States. There are a number of variations of ginseng. Most relate to where the ginseng was grown or cultivated, but each area produces a different level of quality in their ginseng. Asian ginseng (Panax ginseng) is the most common form of ginseng and is considered the original form of the herb. It is still grown in China, Japan, and other countries, but is most prevalent in Korea. Korean ginseng is one of the most popular varieties of Ginseng seen in products today. It is important to note that this species is also one of the most superior in quality of the variations available. This is due to the conditions in which it is grown and the longer span of the growing period that is available. The longer the plant is able to stay in the soil the stronger it becomes and therefore is more effective overall. American ginseng (Panax quinquefolius) is quite accessible today in many products. It is still considered a high quality form of ginseng, but it has been found that the roots contain different proportions of the key components. The claim is that the properties are different in American ginseng because of the conditions under which it is grown. Japanese ginseng (Panax japonicus) is often used as a substitute to the higher grade Asian ginseng and does not have the same strength nor the quality of Asian ginseng. Sanchi ginseng (Panax notoginseng) is native to China and is another of the often used substitutes to Asian ginseng. It is very different in its properties from traditional Panax ginseng and is commonly used for entirely different purposes. Himalayan ginseng (Panax pseudoginseng) is a low strength form of ginseng that is most often used to treat digestive issues. Siberian ginseng (Eleutherococcus senticosus) is similar in form to ginseng, but is a different plant entirely. It has a lower level of potency in treatment, and is also cheaper to buy so is often used as an alternative to ginseng. Siberian ginseng has been shown to have its own tonifying effects, however, and can be used with success in treating immune function problems and as an anti-inflammatory. Red ginseng is a form of Panax ginseng that has been put through a heat treatment and then brewed to turn a reddish color. It is most commonly known for its uses in treating sexual dysfunction, but also has been effective in reducing various types of cancer. The key components in ginseng are the ginsenosides which produce effects in the body similar to the stress hormones released naturally. Depending on the level of potency of the ginseng, these effects can improve a person’s well-being in a number of ways. Ginseng is most often thought of for its stimulating effects and indeed many of its benefits are due to its effect on the body’s secretion of hormones. Ginseng is known to improve mental and physical performance over time as well as stimulating metabolism, improving stamina, and alleviating fatigue. It has also been used to relax the nervous system and lower blood sugar and also improves immune system response and encourages resistance to disease. Overall, ginseng can create strong benefits for many people. Pregnant women should not use it without consulting their doctor first. Children under the age of 18 should also have a doctor’s consultation before beginning the use of ginseng. In any case, it is wise to speak with a physician before beginning the use of any herbal supplement to ensure that there are no potential side effects or contraindications. There are a number of studies that have been done on ginseng and its properties to determine if the health claims are true. Many of these studies have shown some strong data in favor of the claims made about ginseng, yet others have proved inconclusive and further studies need to be completed before any results can be shown. The strongest results from studies on ginseng have been in relation to improving blood sugar, aiding in immune system function, and providing benefits for those with heart conditions. Most studies in these areas have already shown positive results, and further studies are underway to provide more conclusive evidence. Other conditions that have been tested for treatment with ginseng include anemia, ADHD, cancer, dementia, erectile dysfunction, high blood pressure, improving mental performance, supporting liver function, and a number of other illnesses. Most of the results on these studies have been positive in nature, but the data is not yet conclusive enough to be shown as proven. More studies are underway all the time, so results are likely to change over time. Ginseng is relatively side effect free in most adults and has shown a limited number of problems over long term use. There are still some issues that have arisen in individuals taking ginseng. Side effects that have occurred with ginseng use include skin rashes, itching, cough, anxiety, loss of appetite, insomnia, depression, and diarrhea. Other side effects that have been reported less frequently include dizziness, problems with menstruation, heart palpitations and rapid heart rate, headache, edema, nausea, and chest pain. Those on blood thinning medications or with blood clotting issues should speak with a doctor before taking ginseng because it can reduce the effectiveness of medications. Since ginseng has been known to reduce blood sugar levels, those on blood sugar regulating medications should also speak with a physician before starting to use ginseng. Again, pregnant or breastfeeding women should not use ginseng without first consulting their physician. Ginseng is available in a number of forms for use. Fresh ginseng can be sliced and brewed into a tea for consumption or added into soups. It can even be chewed or eaten fresh. The most common form of ginseng found is the dried root or some variation of that. The dried root can also be sliced and brewed into tea, or it can be ground and placed under the tongue for quick absorption. Most ground ginger root is actually put into a pill format for consuming daily. The benefit of buying the actual dried root is that one can ensure that they are receiving a high quality product. It is common that pill formats of ginseng will not have a high potency of the herb. The typical dosage in capsule format is 100 to 200 milligrams taken once or twice per day. 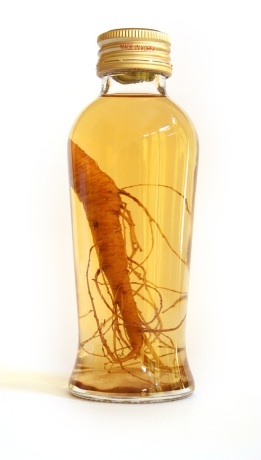 If using a liquid form of ginseng, it is best to take 1 to 2 grams and mix it with water and then drink the mixture. Again, this can be taken once or twice per day. A good standard is to start with a lower dose and then work up to a maximum of 200 milligrams twice per day after determining physical response and potential side effects from taking ginseng. After a three month period of taking ginseng on a daily basis, one should stop using the herb for a period of two weeks to one month before resuming use. Prolonged use without taking a break can cause nervousness and fluid retention. Ginseng is legally sold throughout the United States without any restrictions, so it is very easy to find in most stores. A good place to look for ginseng is at a local health food store because there will be a multitude of options for ginseng supplements and even the actual dried root. Most standard grocery and drug stores will also have ginseng available, but may not have the variety of a health food store. There are many options online for finding ginseng supplements. Amazon.com has hundreds of choices for buying ginseng as does shopping.yahoo.com. It can become overwhelming to try and choose, so initially it is a good idea to shop locally and ask for help from a sales associate at the store. They can often recommend a good product within a specific price range. Ginseng products come in a broad spectrum of prices ranging from $5-10 per bottle up to $50 or more for some liquid tinctures. Cheaper does not necessarily mean low quality, but doing some investigation prior to buying a particular brand is well worth it. Different products have varying levels of the important component ginsenosides and this determines the potency of the product. Check the level contained in a product before buying it. A reasonable product should contain about 4% ginsenosides. There are other ways to try ginseng, specifically in the Arizona brand bottled teas. These can be purchased at a local grocery store and can provide a small glimpse into the effects of ginseng. Drinking the beverage will not provide the same effects as taking a supplement or using the actual root, however, because its potency is very low. Ginseng is a viable option for supplementing one’s diet to aid in mental focus, lowering blood sugar, and providing an energy boost. It is not without its concerns, however, and it will be some time before enough studies are completed to show the benefits or disprove the claims related to ginseng. Anyone deciding to use it should take it slowly and check with a sales clerk at their local health food store to find a quality brand. As always, remember to check with a physician before starting any new herbal supplement to ensure that it will not conflict with any other health issues or medications.